Many of us bought this lie. To this day we consider it great when someone diligently saves for years and years to achieve their version of the Jamaican Dream. Banks STILL advertise saving to us as if it's anything sensible, and we are generally complicit because even though we KNOW on a gut level that it doesn't make sense, we rarely ever force ourselves to face the reality of the situation. 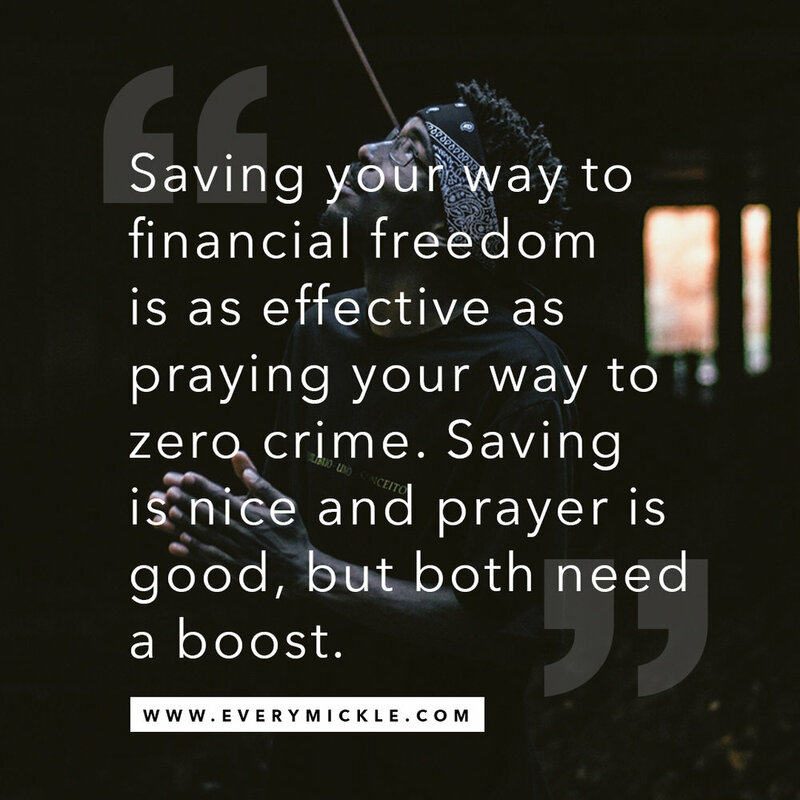 Saving your way to financial freedom is as effective as praying your way to zero crime. Saving is nice and prayer is good, but both need a boost. I can't help you with a prayer breakfast, but I certainly can help you get a bit more out of your finances. So let's get to it. Charts like these are all over every bank. I dare you to find a bank branch that doesn't have a compound interest flyer sitting somewhere waiting to lie to you. Now I can hear the experts shouting already, "Come on! This is why you shouldn't listen to this guy, Compound Interest is a function of math, you can't argue with math!!!" Know what? They're right. The principle of compound interest, which in dead simple terms, is "leaving the money in whatever is making money and letting the gains grow on top of previous gains" cannot be argued with; in fact I use them every day, in my own financial life. So, if I believe in Compound Interest, why am I saying it's a lie and why am I hating on typical saving? Well, it's due to 3 simple but dangerous mistakes that people make (and banks exploit) with regards to saving. Inflation in Jamaica for 2017 was 5.2%. This means that $100 in Jan 2017 was worth $94.8 in Jan 2018. If your savings account didn't grow your money by more than 5.2% for the year, then you're ending up with less than you started with. They don't tell you this up front, but it's a simple fact of life, one you have to account for when it comes to putting money away. In simple terms, Grandma was right, a dollar doesn't go as far as it used to. Remember when $20 could buy a patty? That's inflation at work. Mistake 2 - Bank "Tief"
They're not really tief, but they're kinda "tief". You put your money in an account and they tell you a percentage interest you're going to get, what they often DON'T tell you, are the fees. The fees eat away any gains you might have made from interest. It can be some serious eating too. 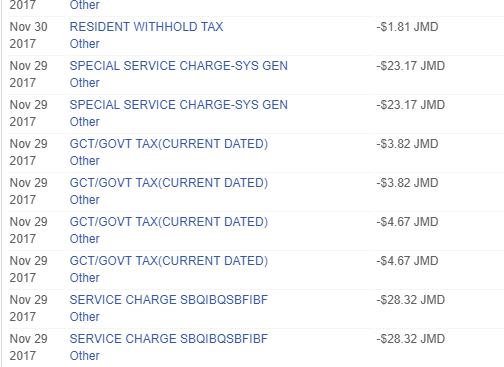 Anyone who knows the term "Special service charge" or "Backdated Service Charge" knows a special kind of pain that having a savings account can bring. Mistake 3 - Bank CHEAP! Trust me! They're cheap. To the point where you're better off leaving the money under your mattress instead of putting it in a Savings Account. According to data from the Bank of Jamaica, up to Sept 2017, the average interest rate on a savings account was 0.67%. Let that sink in. $100 saved for 1 year would give you back 67 cents...which would be a problem since the government is withdrawing red money from circulation. ZERO POINT SIX SEVEN PERCENT...wow! This is one of the KEY things that makes Compound Interest a "lie", because yes that chart above looks real nice when it's worked using 10% interest, here is what it looks like with 0.67% interest. Nice and flat, eh? Save 25 years to get $18,168 on top of your money…and that's not accounting for inflation or fees. So yes, Compound Interest is a lie, or more realistically a pipe dream—at least for savings accounts. So, I've debunked the savings foolishness enough for one day I think; now for solutions. What should you do? Look for a product that is, at the very least, ahead of inflation (the inflation target for 2018 is 4%-6%). Credit Unions offer some OK products along with other financial institutions and of course you know my constant cry, "Get into STOCKS!!" The returns on stocks beat every other product out there. In 2015 the average price growth on the Jamaica Stock Exchange's Main Market was 162%, in 2016 it was 40.7% and in 2017, 52.3%. Compare that to the 0.67% that you're getting from the typical savings account or 5-7% that some investment product is going to give you. The choice is clear. Stocks are the answer. But I Don't Know Where to Start With Stocks?!! Don't worry, I have a nice starter guide here, and the answers to all the usual first time questions (Which broker should I pick? How much money should I start with? How do I get into IPOs?) are also available here. Trust me, once you can read, you have everything at your fingertips, and if you're reading this, I think we're OK. You work hard for your money, let's get your money working hard for you.